Have you ever gone on a road trip through Vegas and didn’t gamble only because you didn’t feel confident in your poker skills? Well that doesn’t have to happen anymore because now you have your own virtual poker coach to show you the ropes. 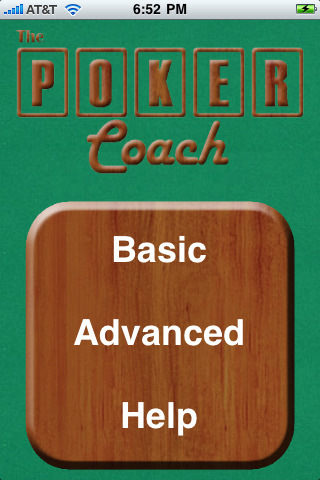 In the PokerCoach iPhone app you will be able to compete against computer opponents as you try to polish your skills. The game has been created with an artificial intelligence that has been configured to help you see the things you are doing wrong and helps you adapt your playing style so that you can start winning more often. There are two basic modes to participate in, including the Basic mode and the Advanced mode. This will help you to base your strategy level by how well you do in each mode. The more you play the better you will get, and soon you won’t feel like the new guy at the poker table anymore. If you are new to poker then this is a great app to help you get started. The basic mode is very easy to use and you will get the hang of it in no time. The advanced mode is also good but I wouldn’t call it “Advanced Poker”. It still is more of just an intermediate poker for the poker noob. Worth downloading if you are new to the game, probably wouldn’t waste my dollar if I already knew how to play. Voted 3 1/2 stars by iPhone app users and can be downloaded for $0.99.